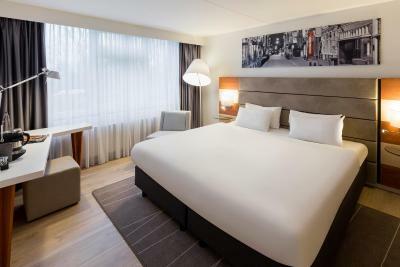 Lock in a great price for Mercure Hotel Amsterdam West – rated 8 by recent guests! Convenient location outside of city. Clean room easy access to public transportation. Good value. 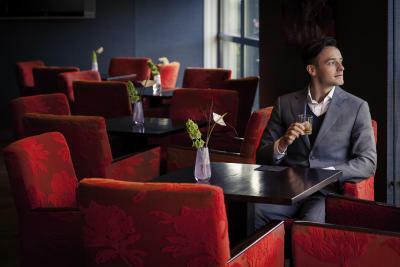 Functional airport hotel just 8 minutes from Schipol...very convenient for quick business meetings or layovers. Staff are lovely. Breakfast adequate and not many fascilities from the little i saw. Again, it's an airport hotel so one doesn't expect resort standards. Breakfast was really good and there were a lot of options-including local honey, which was amazing. The room was extremely nice and clean. The bed was very comfortable and large. I really enjoyed the accommodations of the room itself. Staff were very helpful. The bedroom was fine and a great bathroom. Big fluffy pillows. This is far out of town but very close to the airport with a free shuttle. Staff explained how to get into the town center and supplied three day passes at 26 euros. We loved getting about on the transport - so easy and practical. Great staff. Having a shuttle to and from the airport was nice. The airport shuttle was top notch, got us to and from the airport effectively. The rooms were so nice and spacious, with great bathrooms. 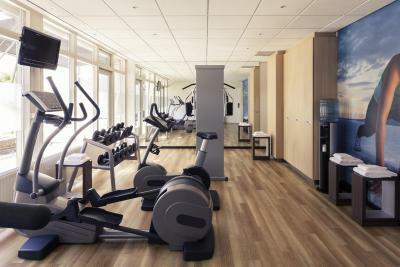 The fitness room was really high end and nice to get in a quick workout. The wifi was great too! Staff was extremely helpful. It’s next to a lovely park and lake as well. The location is near airport and they have free shuttle every 30 minutes to and from Schiphol. It is very convenient since it is easy to go to city centre through Schiphol train station. The front desk staffs are excellent, check in process is fast and they allowed us an early check in. Airport shuttle is convenient for catching early flight. 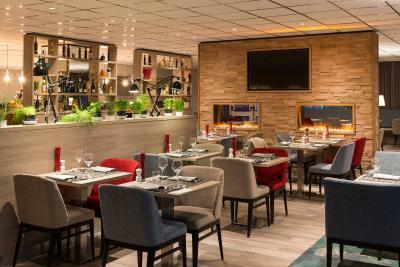 Mercure Hotel Amsterdam West This rating is a reflection of how the property compares to the industry standard when it comes to price, facilities and services available. It's based on a self-evaluation by the property. Use this rating to help choose your stay! One of our best sellers in Amsterdam! This property is a 5-minutes walk from a small lake with a beach in natural park De Oeverlanden. 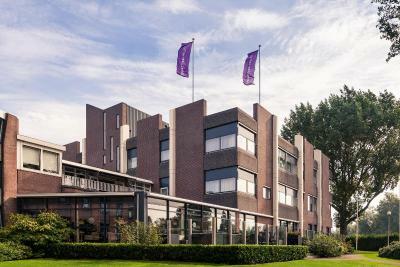 Mercure Hotel Amsterdam West is a 15 minute drive from Amsterdam city center, and a 10 minute drive from Amsterdam Zuid. Schiphol International Airport is a 10 minute drive from the hotel and shuttle services are available upon request from 06.00 till 23.45. 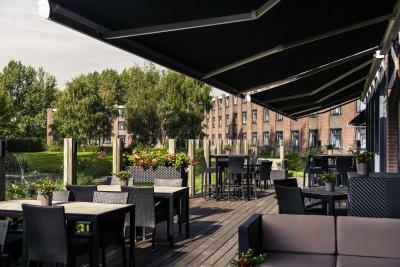 When on the A4 highway, take exit 1-Sloten and from there Mercure Hotel Amsterdam West is a 4 minute drive. Parking is available on site (surcharge). Rooms are practically furnished and include comfortable beds, a TV, mini-bar and desk. All bathrooms feature a shower. The on-site restaurant serves international dishes for lunch and diner. In the summertime, guests can enjoy the terrace with garden views. 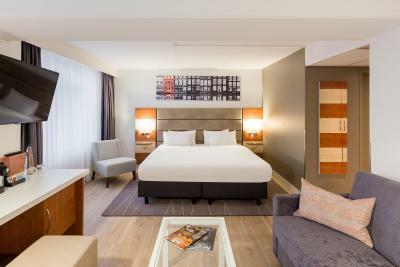 When would you like to stay at Mercure Hotel Amsterdam West? This spacious suite includes extra facilities such as a Nespresso coffee machine, a filled minibar which can be enjoyed free of charge and a sitting area with sofa bed. Private parking is available on site (reservation is not needed) and costs EUR 17.50 per day. Recently renovated rooms with a flat-screen TV, free Wi-Fi and a private bathroom. 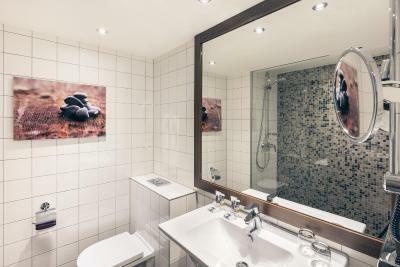 This room has extras including a morning paper, bathrobe with slippers, extra bath amenities and stocked minibar free of charge. House Rules Mercure Hotel Amsterdam West takes special requests – add in the next step! 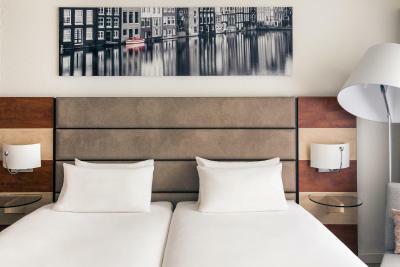 Mercure Hotel Amsterdam West accepts these cards and reserves the right to temporarily hold an amount prior to arrival. Please note that the airport shuttle is available at a surcharge between 6:00 and 14:00 hrs and between 16:00 and 00:00 hrs. Tickets to go to the Airport can be purchased at the reception. From the Airport to the hotel the shuttle is free and guest do not need to reserve a seat. Lunch and dinner are available at the hotel at a surcharge. Shuttle from airport. Staff. Publictransport. The breakfast was really good (not included in the price). The hotel is a very good choice if you are traveling for work or if you need to spend a night near the airport just as I did. The bedroom was big and everything was really clean. Awkward access by foot from the local bus stop, unclear where to access the reception from the main road. Air conditioning not up to much. Complimentary upgrade. Polite and helpful staff. Clean. This hotel was the worst hotel I have ever stayed in absolutely disgusting. Someone threw up near one of the rooms and they never bothered cleaning it up. The shuttle bus was free on the way to the airport then they all of a sudden decided to charge us on the way back. Comfy bed and only 20 minutes in an Uber to the centre! Great breakfast too!!! I didn’t like their charging me Euro 5 (just 1 time by a reception staff I have not encountered before in previous stays) for a ride to Schiphol. The shuttle will still make the run with or without me as passenger so why not let me ride free. It’s one little pleasure that makes me loyal to them. I like the convenience of FREE shuttle to hotel from Sciphol and vice versa. The location. It was very far from the city center. It's good for travelers needing to be near the airport in case they had an early flight out the next morning. But it's not ideal for those wanting to be close to the city center. Room was nicely appointed and clean. Hotel was very far away from the city and we did not know how to get from city center to the hotel.